Our In-store technician has years of experience removing those nasty virus' & spyware from computers! With this service we can remove the problem without you loosing your data or having to re-install your software. Far too many computer stores take the 'easy way out' by formatting your machine resulting in data loss. Our rate is $75.00 for less than 2 computer profiles. In-store only repairs are varied and can be estimated at the time of your visit. 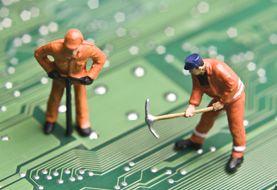 We offer hardware and software repairs. For software repairs we require that your provide us with the original authenticated software you purchased.